The legendary Northern Lights (Aurora Borealis) are one of the most beautiful and spectacular natural phenomena in the world, visible in the higher latitudes of the Northern hemisphere. That means one of the best places to see the Northern Lights is in Canada. Viewing this natural light show is easier than you’d think! 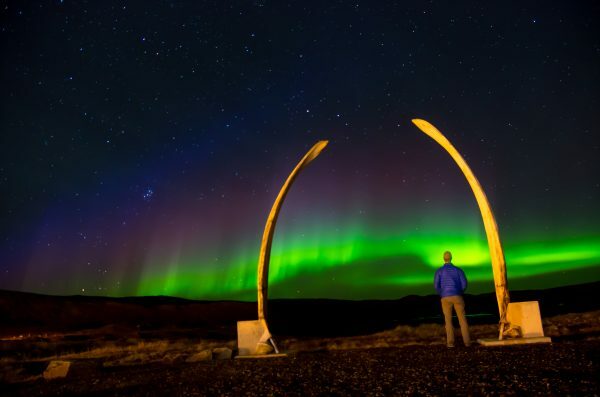 From August to May, the Northern Lights bejewel the night sky in the Canadian Arctic, against a backdrop of incredible scenery and possible rare wildlife sightings. World-renowned as one of nature’s most incredible wonders, the shimmering lights of the aurora are the result of collisions between electrically charged particles. Gaseous particles in the Earth’s atmosphere collide with charged particles released from the sun’s atmosphere. The Northern Lights appear in many colours including red, yellow, green, blue and violet, and can appear in many forms including patches or scattered clouds, streamers, arcs, rippling curtains or shooting rays, lighting up the sky. Different altitudes and types of gas particles that collide cause the variations in colour. The most common auroral colour is a pale yellowish-green. This display is caused by oxygen molecules located approximately 96 km (60 miles) above the earth. Blue or purple-red auroras are created by nitrogen, and though rare, all-red auroras are produced by oxygen at a high altitude, at heights of up to 321 km (200 miles). Seen both in the northern and southern hemisphere, the Aurora occur in an irregularly-shaped oval centred over each magnetic pole – the auroral oval. In the north, it is known as the Aurora Borealis and the Aurora Australis in the south. 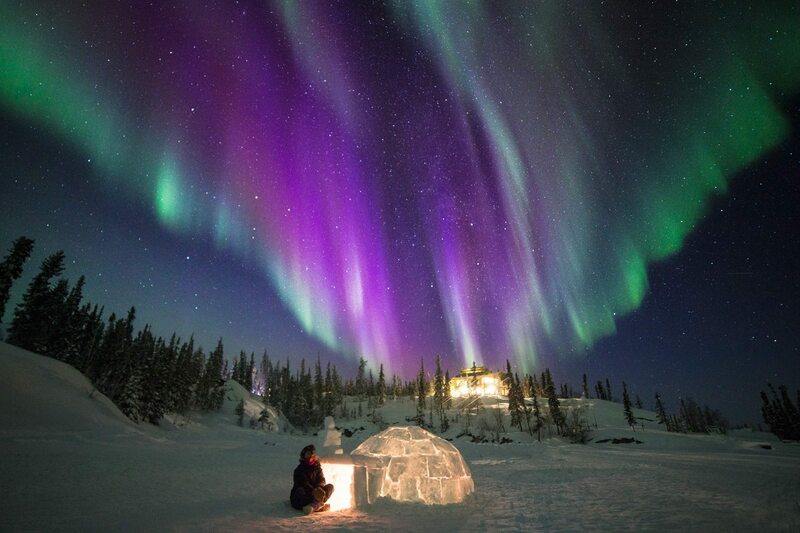 The best places to watch the lights in North America are in the northwestern parts of Canada – including Nunavut. Smaller communities and remote locations without light pollution are great for watching the aurora displays – one of the reasons we love the Canadian Arctic! These dancing light shows are most clearly seen at night against a dark sky. With long periods of darkness and a higher frequency of clear nights, winter is a great season to view the Northern Lights in the north. Our Polar Bear Migration Fly-In Photo Safari provides an incredible off-the-grid experience to witness the Northern Lights in October and November. This seven-day trip offers exclusive opportunities to view polar bears up-close during the day and dazzling Northern Lights at night, in the comfort of our remote Polar Bear Cabins, located 110 km south of Arviat, Nunavut, on the coast of Hudson Bay. View trip details and departures here. 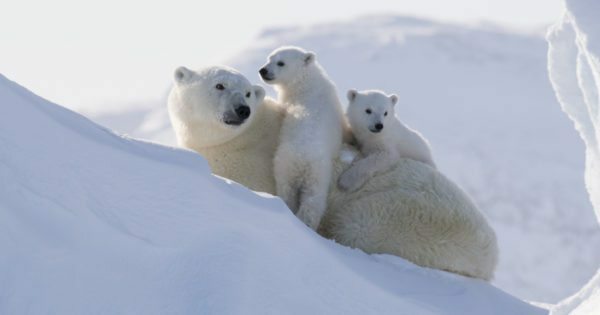 For couples, families or groups of up to 4, our Nanuvik Polar Bear Migration Safari is a perfect bespoke adventure for chances to view polar bears and Northern Lights in October and November. Get opportunities to view polar bears from our Polar Bear Cabin during the day and settle in to view Northern Lights at night, conditions depending. This photo safari takes you into the heart of the high eastern Arctic, where travellers seldom go, in March and April. See the Northern Lights at night after spending days capturing amazing photos of polar bears close-up, as they venture on to the sea ice and climb majestic icebergs on this nine-day trip. This lodge-based expedition provides the opportunity to witness the Northern Lights at night after days viewing polar bear cubs and their mothers at a close proximity. Located in the world’s largest polar bear denning area in Wapusk National Park, Manitoba, travellers can experience this 10-day trip in March. 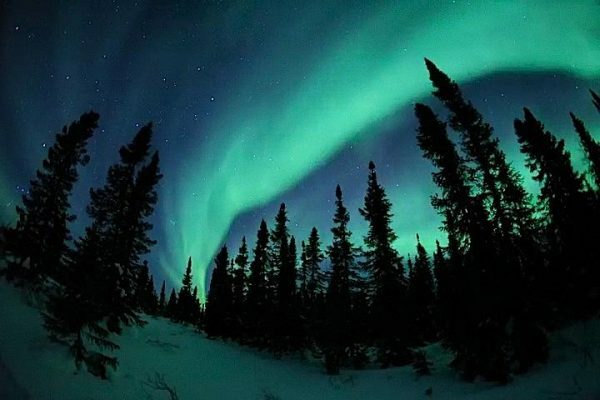 Get a front-row seat to watch the magical Northern Lights at this remote and rustic lodge, located deep in the Canadian wilderness of Yellowknife, Northwest Territories. This trip has options of four to 9-night packages, from December to April. Want to see the Northern Lights but not sure which trip is for you? Click here to get in touch with one of our Travel Advisors – they are happy to help! Want to create your own Northern Lights adventure? Contact us to ask about custom trips. Very descriptive article 6 ways to see Northern Lights in the Canadian Arctic | Arctic Kingdom , I loved that a lot. Will there be a part 2? So glad you enjoyed it! Absolutely part two – the bucket list is coming in 2017! Our Arctic Travel Advisors would be happy to help you book a trip to see the Northern Lights. Please contact us here: https://arctickingdom.com/contact-us/ or email adventures@arctickingdom.com.